There are no minutes for the April 2014 meeting because PHS did not have its own meeting. We attended the West Texas Historical Society meeting instead. More details are available in this post. The Fall Meeting of the Permian Historical Society was held in the Cosden Room at the newly restored Hotel Settles in Big Spring. There were 65 members and guests in attendance. Registration began at 9:00 a.m. Coffee, iced tea, juice, and muffins were enjoyed by the registrants as they perused the books for sale and visited with one another. Debbie Wegman, Director of the Big Spring Convention & Visitors Bureau, thanked PHS for choosing the historic hotel as their meeting place and gave each attendee a goody bag to welcome them to Big Spring. Donna Bell, Best Presentation Award Chair, collected today’s ballots. Jim Collett was announced as the Best Presentation winner of the Spring Meeting for his We Almost Weren’t Here program about McCamey’s surprisingly continued existence. 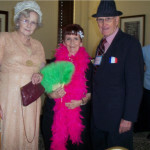 Evelyn Stroder won the Best Costume prize, 28 year old Micah Harrison won the Youngest Attendee prize, and 90 year old Wayne Bonner was the Oldest Attendee. Door prizes were won by Peggy Kelton, Carole Lawson, Winston Sosebee, Charlene Ragan, Bo Fryar, Rene Rogers, Anita Morris, Roger Goertz, Sue Ann Damron, Evelyn Stroder, Billie Jean Ferguson, Nancy Koger, Susie Combs and Mary Sosebee. President Kelton thanked all for coming and directed them to line up for a delicious BBQ lunch provided by the hotel. 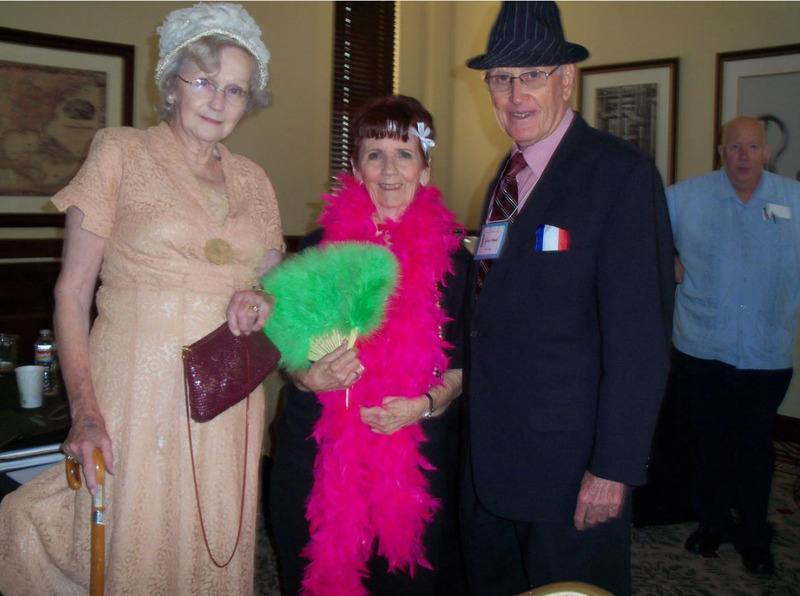 Costume contest winners Evelyn Stroder, Peggy Kelton and Lane Bond at Big Spring. 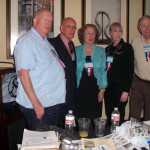 Speakers from the Big Spring meeting. 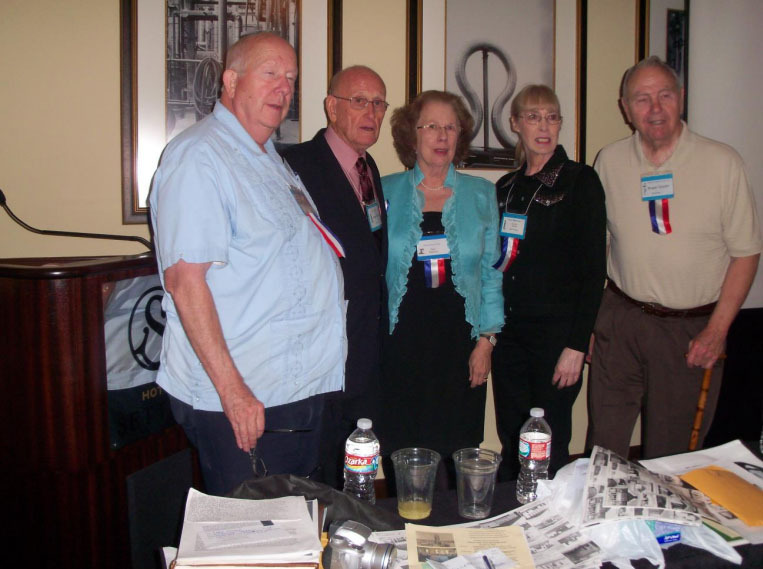 L-R Craig Fischer, Lane Bond, Janie Harrison, Sue Ann Damron & Roger Goertz. The Spring Meeting of the Permian Historical Society was held at the Petroleum Museum in Midland. There were 34 registered members and guests. Registration began at 9:00 a.m. Prior to the start of the day’s presentations, attendees were able to enjoy a light breakfast, buy books from several authors, and visit with one another. President Peggy Kelton welcomed all and turned the meeting over to vice president Betty Cash who introduced the speakers. Darrell Ward, KOSA-TV weatherman, and Crane rancher Gordon Hooper presented The Big Drift Weather Story. The big drift occurred in the mid 1880s when the area received eighteen inches of snow and it was cold enough long enough for the Pecos to freeze. As there were no fences at the time, thousands of cattle drifted with the storm up to one hundred miles away. In 1918, Gordon’s father was living in Loving, New Mexico when a blizzard lasting four or five days happened. Mules froze in the corral, cattle’s ears and tails froze off and stock that drifted with the storm bunched up at the fences and died. Other weather events through the years were reported by Mr. Ward, such as the 1949 ice storm in Jenkins, Texas that left an inch of ice on everything. The wet years that West Texas received from 1882 to 1885 together with the newly constructed T & P railroad induced hundreds of farmers to believe the land promoters’ spiels about the farming opportunities in usually dry West Texas. Jim Collett, PHS’s yearbook editor, gave a power point presentation on We Almost Weren’t Here. This well documented history of the origins and early history of McCamey was enhanced by the wonderful photographs displayed. Jim told how chance and stupidity involving several eccentric individuals led to McCamey’s continued existence, while Sherwood, Stiles and Upland became ghost towns as the railroads changed paths through the years. Door prizes were won by Dorothy Jones, Jim Sears, Nancy Koger, Guy McCrary, Beth Hoover, Murray Sauders, Sherry Phillips, Gordon Hooper, Sue Ann Damron and Betty Damron. As the Best Presentation ballots were being turned in, President Kelton announced that Joe Specht had won Best Presentation at the October 2012 meeting in Monahans for Sneaky Pete:The West Tenor Sax Stylings of Jimmy Seals of Rankin, Texas. After a wonderful lunch catered by the Shacklefords, the business session began. Reports on events and historical happenings in various counties were given by the following: Betty Damron – Crane, Nancy Koger – Howard, Beth Hoover – Crockett, Carolyn Hodge – Reagan, Sherry Phillips – Upton, Diantha Dawkins and Burr Williams – Midland. Patrick Dearen suggested PHS promote the digitization of the Midland newspaper and other papers in the area. Information in old newspapers is very important and digitization is a tremendous help to historians. Lane Bond invited everyone to the Fall Meeting which will be held in Big Spring on the 26 October 2013 at the historic and newly restored Settles Hotel. The Fall Meeting of the Permian Historical Society was held at the Community-Convention Center in Monahans. There were 24 registered members and guests. Registration began at 9:00 a.m. Coffee, orange juice, a fruit tray, cinnamon rolls and peanut butter rolls were available for breakfast. Before the programs began at 10:00 a.m., attendees ate, visited, picked up their annuals from Editor Jim Collett, bought past annuals, purchased books from Glenn Williford, enjoyed the hooked rugs done for Texas’ sesquicentennial that show scenes from Ward County’s history and viewed the display of insignia of the squadrons that had trained at the Peyote base. Investments Chair J. Tillapaugh welcomed everyone and introduced the day’s speakers. Glenn Williford, former Sheriff of Upton County and afterwards an educator and author, told of the events following the murders of former Texas Rangers Dave Allison and Horace Roberson by Tom Ross and Milt Good on April 1, 1923 in Seminole. After hearing the backgrounds of all four, it was hard to tell the good guys from the bad guys. The “bad” guy Milt Good, who was sentenced to a lengthy prison sentence, found a friend in Governor “Ma” Ferguson who pardoned him after serving only ten years of his sentence. J. Tillapaugh then told of a grad student of his that had researched the pardon of her grandfather by Governor Ferguson. The student’s great aunt still had proof in her possession that $2000 had been paid to the corrupt governor for the pardon. Joe Specht then presented a brief version of his annual article, The West Tenor Sax Stylings of Jimmy Seals of Rankin, Texas. Mr. Specht told of Seals’ boyhood in West Texas and highlighted the progress of Seals’ career by intermittently playing the music of this talented self-taught musician. The last speaker was Travis Sawyer, chair of the Ward County Historical Commission, who gave a power point program on the history of the Rattlesnake Bomber Base and the $12 million project underway to move its museum from Peyote to Monahans. Scott Jordan, Executive Director of the Pecos Trail Region, was introduced. All were invited to join Charles and Evelyn Stroder to celebrate their 60th Anniversary on November 17th at 10:00 a.m. at the First Baptist Church in Crane. Lane Bond collected the Best Presentation ballots. Sue Ann Damron announced that Barbara Barton won the Best Presentation Award for her program One Feisty Schoolmarm at the 2012 Spring Meeting. Damron then drew the tickets for the door prizes, which were won by Rubin Vasquez, Mark White, Joe Specht, Joy Fletcher, Jeanie Clampton, Beth Hoover and Evelyn Shroder. After a great chicken-fried steak lunch, all were encouraged to visit the Million Barrel Museum and the Monahans State Park Visitor Center.